Jalpaiguri is a city in the state of West Bengal, India. It is the headquarters of Jalpaiguri district, and the divisional headquarters of the North Bengal region. Jalpaiguri - this narrow stretch of land lying between the Sikkim – Darjeeling Himalayas and Gangetic West Bengal has more than often evoked a sense of both eerie and romanticism in many a heart since the early British Rule. A major stretch of area is bordered in the north by Bhutan and hence the name - DOOARS/DUARS which mean - ' the Door to Bhutan'. Jalpaiguri - this narrow stretch of land lying between the Sikkim - Darjeeling Himalayas and Gangetic West Bengal has more than often evoked a sense of both eerie and romanticism in many a heart since the early British Rule. Veined by mighty rivers like the Teesta,Torsa, Jaldhaka, Dyna, Neora, Sankosh etc. this piece of land has been aptly named as the land of 'Tea, Timber & Tourism'. A major stretch of area is bordered in the north by Bhutan and hence the name - DOOARS/DUARS which mean - Door of Bhutan. Rarely one can find a place like Jalpaiguri that is so potentially rich in tourism. But a major part of it still remains to be exploited. Turbulent rivers battling out of the steep gorges, the vast stretches of forest cover, the undulating span of Tea Estates and the panoramic grandeur of the Himalayas are only a few jewels that made the British ground their roots deep into the heart of this land. Just drive around or take a hike, never will your eyes feel to rest. If a tourist is a nature lover or an admirer of Wild Life there cannot be a better place than this for him. He can run wild in the various Sanctuaries, National Parks & Tiger Reserves that are on offer. Garumara N.P., Jaldapara W.L.S. etc. are only a few. One can leissure out his time by the sides of the turbulent rivers or simply roll through the Tea Gardens. The more adventureres ones may prefer to trek to Rupang Valley & Buxa-Duar in Buxa Tiger Reserve. Apart from these, there are very old temples like the Jalpeshwar and Jatileshwar. Persons seeking to smell history can take a look at the Prisoners call at the Buxa Fort area where fighters were imprisoned during the pre indepence era. 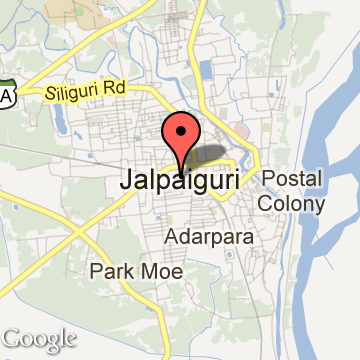 How To Reach JalpaiguriJalpaiguri is better known as the headquarters of the district having the same name. The town is located at a distance of about 16 km from Siliguri. Jalpaiguri is well connected to state capital Kolkata as well as the other states of India, by bus, train and aerial route. The well connected transport system makes it easier to travel to and from the place. Apart from the excellent inter-city transportation, the intra-city traveling system works well, thereby making exploring the district easier. Check out the in-detail information on how to reach Jalpaiguri, by all the three transport systems. The name of the city Jalpaiguri actually comes from the Bhutanese term je-le-pe-gu-ri meaning a place where warm clothes are traded, suggesting a trading center.Another suggestion is that it is from the word Jalpai meaning olive, and Guri meaning place. Jalpaiguri once had many olive trees. With time, Jalpaiguri emerged as the most important city next to Siliguri in North Bengal. Lying just 42 kilometres away from Siliguri, it is the Twin city to Siliguri. Jalpaiguri is the largest city and is presently the headquarters of the Jalpaiguri District and also the headquarters of the Jalpaiguri Division, comprising all districts of North Bengal. Jalpaiguri Tourism - Get all information on Jalpaiguri tourist places and sightseeing tours. Our website helps you plan your next tour and gives you great ideas on what to do, where to eat, where to stay and when to go there. We give the best information from the web to give you precise, meaningful and useful travel guide for leading places to visit in India and from across the world. Our travel information on JALPAIGURI tourist places, tourist attractions, major sightseeing, the best time to visit, the top places to visit in Jalpaiguri, the must-see things to see and do, maps, restaurants, hotels, nearby tourist destinations, local public information and more. To start with check out information on how to reach Jalpaiguri.